KENANSVILLE, Fla. (AP) — Wildlife officials say a worker at a central Florida ecotourism attraction was injured in an alligator attack. 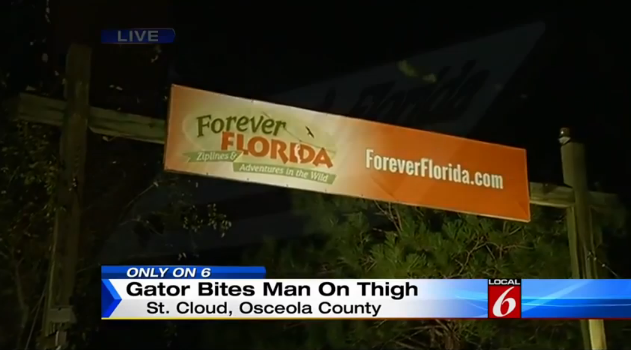 The Florida Fish and Wildlife Conservation Commission reports that 46-year-old Sergio Hernandez was removing plants in a pond at Forever Florida in Osceola County last week when an alligator attacked. Officials say the animal took a chunk out of Hernandez's leg, an injury that required surgery. Trappers responded and removed two alligators, one measuring 11 feet and another measuring 8 1/2 feet. Forever Florida offers a zip line course, camping and horseback riding. WKMG-TV reports that the alligator that attacked Hernandez was not in the attraction's care.